The UN’s Sustainable Development Goals are a plan of action designed with the intent to eradicate poverty “in all its forms and dimensions” and establish universal world peace by 2030 in order to move towards a more sustainable future. 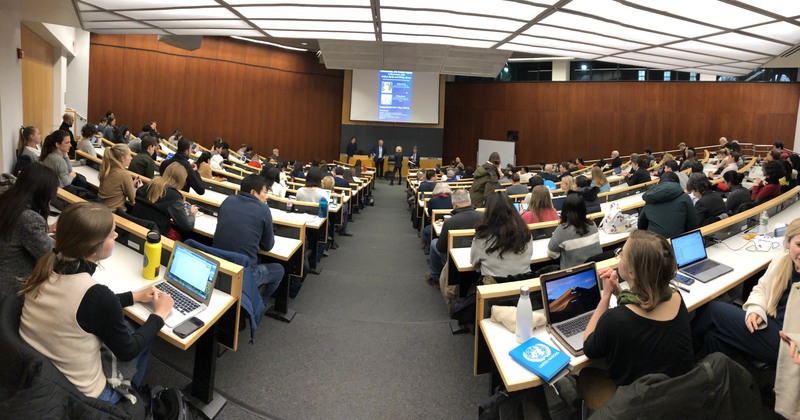 On January 30, Columbia welcomed Philip Alston and Jeffrey Sachs to speak on the issue of “Financing the SDGs, Privatization, and Human Rights.” The event was co-sponsored by the Columbia Center on Sustainable Development, the SIPA MPA in Development Practice Program, the ISHR, RightsLink, and the Human Rights Institute. 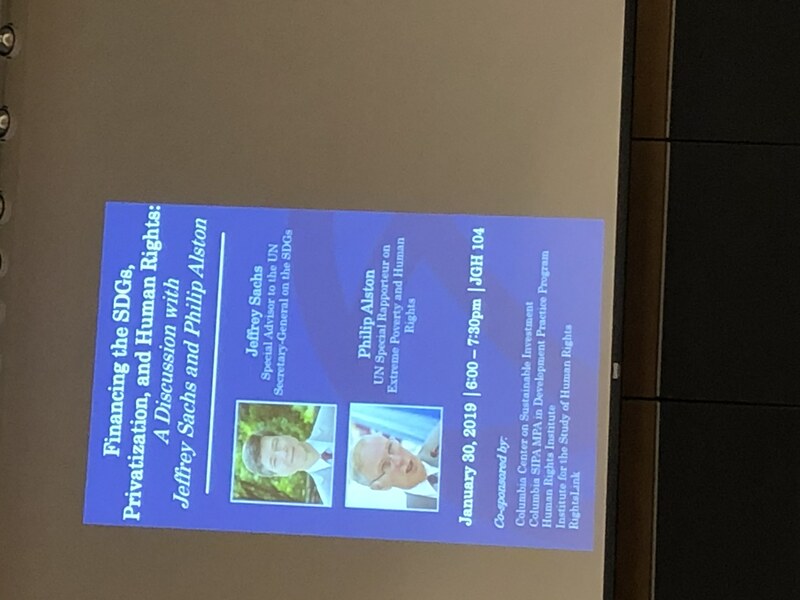 Sachs is the Special Advisor to the UN Secretary-General on the SDGs and Alston is the UN’s Special Rapporteur on Extreme Poverty and Human Rights. To begin the conversation about the intersection of the SDGs, Human Rights, and the increasing problem of privatization in the achievement of the SDGs, the moderator asked Alston and Sachs about their opinions on the ways in which the SDG and Human Rights frameworks converge and diverge in terms of their goals and objectives. Both men agreed that the basic concepts of the two are incredibly similar, Alston stating that human rights aims to eliminate poverty and promote general equality and a range of other issues addressed in the SDGs. Rhetorically, said Sachs, the SDGs take the same perspective that the Human Rights movement has always taken since the establishment of the UDHR in 1948. The first UN decade for development began in 1961 and stated its goals in the language of economic and social human rights, he said. However, said Alston, the human rights language in the SDGs are treated more like “token references” and “in practice, there has been a greater division in efforts to promote the SDGS…while also promoting respect for human rights.” Sachs argued that this is likely because human rights tend to be downplayed in the negotiating process to account for countries like China and the US rejecting references to human rights in the development context. Human Rights language adds a “measure of intellectual and moral discipline and harder edge to this” than states wish to place on the sustainable agenda. Ultimately, said Sachs, this is rooted in power: poverty is a terrible barrier but we cannot realize these rights because the conditions to realize them are about who has power and how it is used. On average, he estimated that the US can devote $18,000 per capita per year to development like health and education whereas a poor country may only have $160 per capita. This stark contrast is why he believes that the richer world ought to help pay for the poorer world to be able to implement the development goals that the SDGs aspire to. At the global level, he argues for international transfers and taxes beyond mere development assistance, which averages only 0.3% of the income of rich countries. “There is no global community,” said Sachs. We need international transfers of at least 2-4% as part of the international scene for financing the SDGs. Sachs added that we need to map out what things should be private and public. When it comes to anything that we generally want universally applied, he said the first thing that must be initiated is public financing. Universality is key, he stressed. We cannot have competitive private infrastructure because infrastructure is something that needs to be equal for all. Development goods like health care are based on values; thus we should be publicly financing them. The SDGs as a whole do envision a role for the private sector, but that element has been overused by governments. Alston and Sachs were asked how this trend of privatization can be rolled back or realigned with the true SDGs. Quite simply, both agree that human rights can be incredibly important for realigning development values. 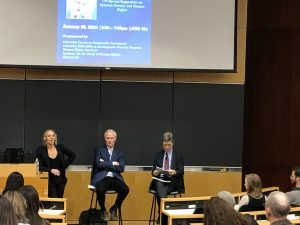 Alston said that “we have to start pushing back against the accepted wisdom that [privatization] is the way to go.” We shouldn’t be looking to the corporate world as engines for promoting human rights. We need to start at the beginning with public financing of the rights to education and health care, to name a few. Sachs insisted that human rights language can be incredibly important in this process because it resonates and is true. Fundamentally, he said, this is a political challenge to discredit big corporations. When it comes to financing the SDGs, there are a lot of nuanced decisions that go into where and how funds are directed. 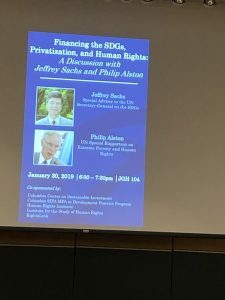 However, it is clear from our discussion with Alston and Sachs that moving away from privatization and using human rights rhetoric to support public financing is a strategy that predicts progress in SDG realization as we near 2030.